Summer is definitely here and today was the first day that the mercury hit 100 degrees. Schools out and of course my kids are already bored. Not because of lack of things to do, but because it's just too darn hot to do anything outside. When this happens we usually try to find a few fun activities to do inside. 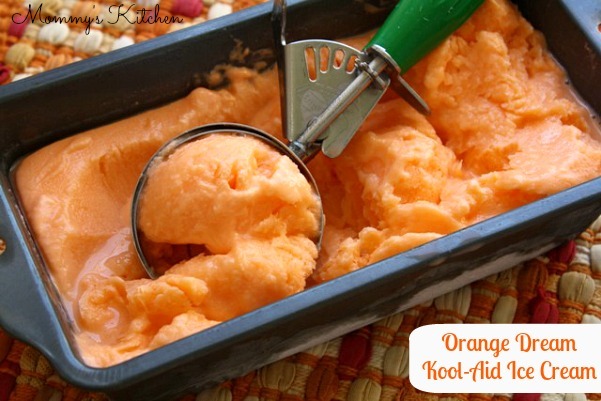 Homemade ice cream was on our Summer Bucket List, so when Walmart and Kool-Aid asked me to share a recipe or idea using their fruity drink mix I knew just what to make, Homemade Kool-Aid Ice Cream! We had so much fun and it was super, because it only takes 4 ingredients. The hardest part was deciding on a flavor that we all agreed on. We finally settled on two flavors, orange and strawberry, because you can never have too much ice cream. Kool-Aid has been a part of my life for as long as I can remember. Growing up my brothers and I drank it like water. When I got a little older I remember my 3 year old nephew running around the house with his little permanent Tool-Aid mustache as he called it. His two favorite things in life were Kool-Aid and cereal. Not together of course. Today my own kids enjoy the fruity taste of Kool-Aid and it never seems to go out of style. We love making Popsicles, creamy Kool-Aid pie, ice cream and slushies. I hope you'll give a our ice cream recipe a try. The orange reminds me of orange sherbet or a orange dreamsicle, so that was definitely our favorite. Do you have a fun creative idea using Kool-Aid? 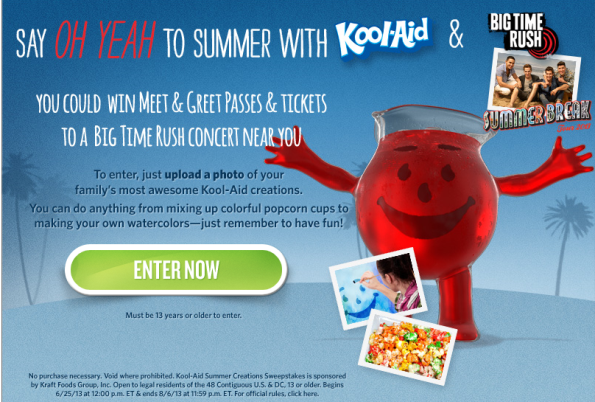 If so Kool-Aid is offering a chance to win Meet & Greet passes plus tickets to a Big Time Rush concert near you. To enter just submit a photo of your own “Kool-Aid Creation” at the Kool-Aid Summer Creations Sweepstakes. You can also download the free Shoparoo app and snap a picture of your Walmart receipt with at least $4 worth of Kool-Aid purchases. You will receive a unique code to use at Ticketmaster Kiosks in Walmart or at Ticketmaster.com to get a Big Time Rush family four pack for $50. Complete details are available at Walmart.com. The Summer Kool-Aid Summer Creations Sweepstakes begins on 6/25/13 and ends on 8/6/13 at 11:59 ET. 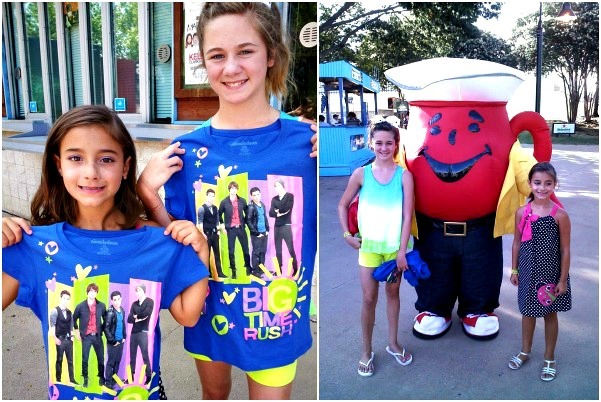 I've included a photo of my daughter and my friends daughter waiting to get into the Big Time Rush concert. This was the Dallas stop for the Big Time Rush Summer Break Tour. While we were waiting we caught up with Mr. Kool-Aid himself and posed for a photo. 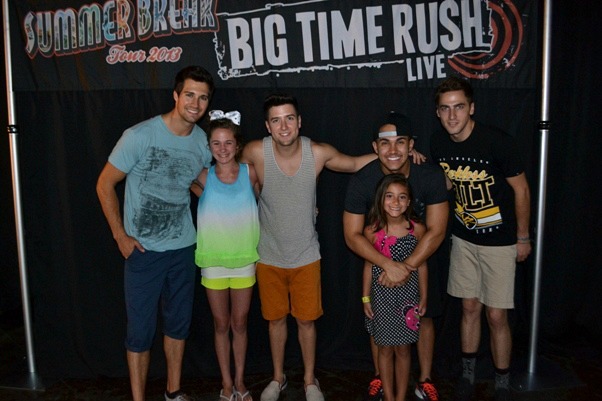 The girls were so excited to have the opportunity to meet the guys from Big Time Rush and pose for a photo. All I can say is these two girls were Happy Happy Happy! Mix one packet unsweetened Kool-Aid mix together with granulated sugar. Add the milk, half & half and mix until dissolved. Pour mixture into a shallow freezer container. Freeze for 1 - 2 hours until slightly thickened. Transfer mixture to a bowl and beat until smooth (I used a wire whisk). Return to the freezer container, cover and freeze at least 6 hours. Remove 20 minutes before serving to soften slightly. Recipe yields - 3 cups. I have included some easy step by step photos of how easy this ice cream is to make. The best part about the whole recipe is that you don't need any fancy ice cream maker. Just flavor, mix and freeze. Cook's Note: I used orange and strawberry Kool-aid for this recipe. I have also had a few people ask if 2% milk can be substituted for whole milk. I think it should still be creamy using 2% since the half & half is added. I also used my small bread pans to freeze the ice cream instead of a freezer container. This is a sponsored post. As a participant in the Walmart Moms Program, I have received samples and compensation for my time and efforts in creating this post. All thoughts and opinions stated above are 100% entirely my own. Can this be done with splenda instead of sugar? I haven't ever tried it with Splena or any other sugar substitute, so I'm not sure. The only substitute I do use is Truvia baking blend and I know the conversion is half of regular sugar. Sorry I couldn't be of more help. Hello...can I use skim milk for this recipe or 2%? I used a wire whisk, but I'm sure a hand mixer will work just as well. This looks like fun. My daycare kids always loved the Kool-Aid playdough I made. What a KOOL (can't believe I'm the first to say that!) idea. =) Pinning and looking forward to making it with my grandkids. LOVED seeing your face on the video Brandie shared of your time in N'ville. How neat! I think 2% milk could be used in place of whole milk. It still has the half & half for the creaminess. How fun, and I love that you don't need an icecream maker. The colors are so intense too. . . I can't wait to try this. 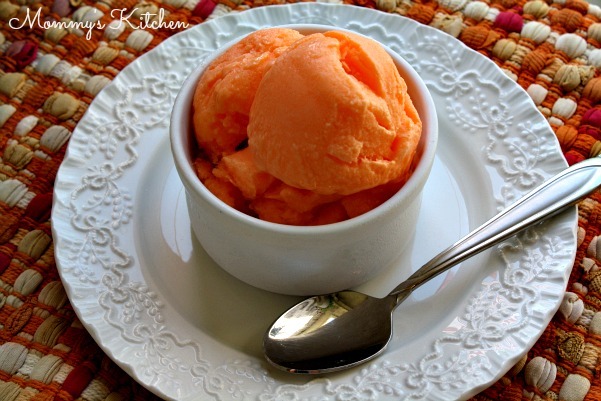 I love homemade ice creams but don't have an ice cream maker. This is perfect. Thanks! I can't wait to try other flavors. I found a cherry limeade Kool-Aid, so that should be fun. Can coconut milk be subsituted for the 2% milk? I personally have never tried coconut milk. All I can say is give it a try. I know I have used almond milk to replace regular milk before in recipes. Would this work with presweetened Kool Aid? I have a container of that and we don't drink Kool Aid. Half & Half is half cream and half milk. You can find it by the regular milk. Can you use fat-free half and half?? Hi, can anyone advise where to get Kool Aid in Singapore? Love ice cream, but no Maker. This would be the Best. & Fun!? I am doing low carb and I will definitely try this but using heavy cream and liquid spenda. That would cut the carbs down to basically nothing. Thanks. Any idea if soy or coconut milk can be used? My son is allergic to cow's milk. I know this is an old post, but I wanted to give a review. Last night I made cherry flavor ( I used 1 cup of evaporated milk) and watermelon flavor ( used 1 cup of half & half) both were delicious. I think the cherry one with evaporated milk was more creamier and they were a tad sweet. Next I am going to make pink lemonade. Love this easy recipe. I will try to answer some of the ? 's as best that I can. I'm sure coconut or almond milk can be used in place of regular milk. Half & Half is half milk and half cream. I think using fat free half & half is fine as well. Adding crushed fruit would be a nice addition. All I can say is give it a try and see how it works out. @MaryH, exactly my point. 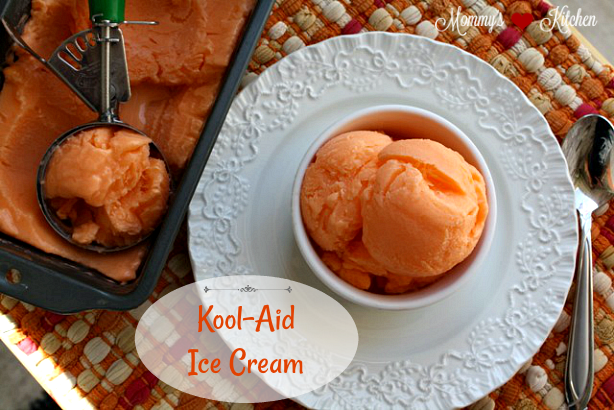 This is a old recipe made back in the day and no one has died of eating kool aid ice cream. So many people are all up over this recipe because of food dye. All I can say is our grandmothers are still with us and last time I looked they did not die of of kool aid or food dye cancer LOL. I cant wait to try this, my ideal mix of flavors will be half grape, and half black cherry. I make this combo to drink, the kids love it, oh what endless possibilities, thanks for the info! 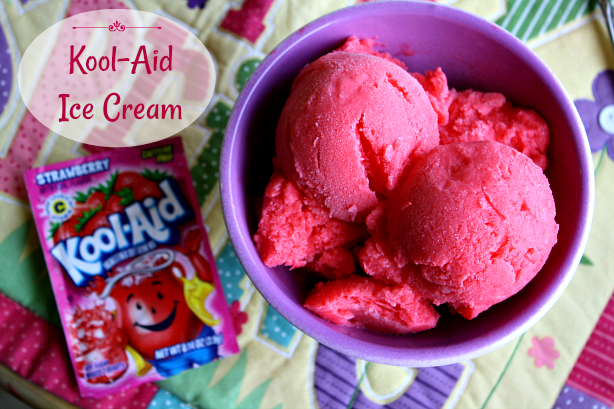 I just made a super simple ice cream using light whipping cream, sugar, and a packet of Kool-Aid. It worked great, so I went to see if I had discovered a new recipe, but I see you all beat me to it. I froze my ice cream in a small glass dish and it came out perfectly. I didn't even have to stir it, nor did I wait overnight. I now know an ice-cream maker is not needed, nor are the high-priced boxes of ice cream. I will make my own ice cream always!!!!! Coconut milk ice-cream is fantastic and a good alternative from using dairy, especially for those who can't eat dairy. It would be best to combine coconut cream along with the milk for the best flavor and using lime or pineapple Kool-Aid packs for added flavor and color. My Mom and Grandma used to make this when we were kids! We were very excited that there was a special treat in the freezer that we could look forward to later in the afternoon on a hot summer day of playing outdoors while the kitchen floor was being mopped and no one was allowed to come in until the floor was dry! Thanks for the yummy photo and the recipe! What about substituting Eagle Brand Sweetened condensed milk for the half and half? Would that be too sweet?